Lived here most of my life, but go to my "home state" of Hawaii to see kids and grandkids often. Last time I was there, I went to WoodCraft to get some stuff to build guitars, and a little Sarge folding knife kit caught my eye, as well as a ZHEN paring knife blade for my wife. Enjoyed making the scales for the "toy" folder, and Mrs.Charisjapan love the little Damascus knife in the kitchen. I just ordered a few blades and kits from KnifeKits, and have been digging through the stash for some interesting scales. I will have a lot of questions, and hope to make some friends. The scales for the folding are Lignum Vitae, my first time to use this wood. A deserved reputation, was a lot of work to shape. A friend of mine was a "bobby" in Birmingham, England, and said his nightstick (truncheon to him) was made of this, and was almost as indestructible as Captain America's shield. The paring knife's scales are Macassar Ebony, and while pretty hard, much easier to work with. I just put some Briwax on it, which seems to be good for kitchen work. I only finished these about a week ago, but already using daily. My wife loves the hefty little paring knife, so will probably retire the ebony Heinkel we've had for 30 years ... or give it to one of our kids. Nice work! You've got the 'bug'. For handle material you might also look at stabilized wood offered at most any knife supply store. Such woods are real wood suffused with a plastic resin. They look good, polish easily, and require no other finishing. 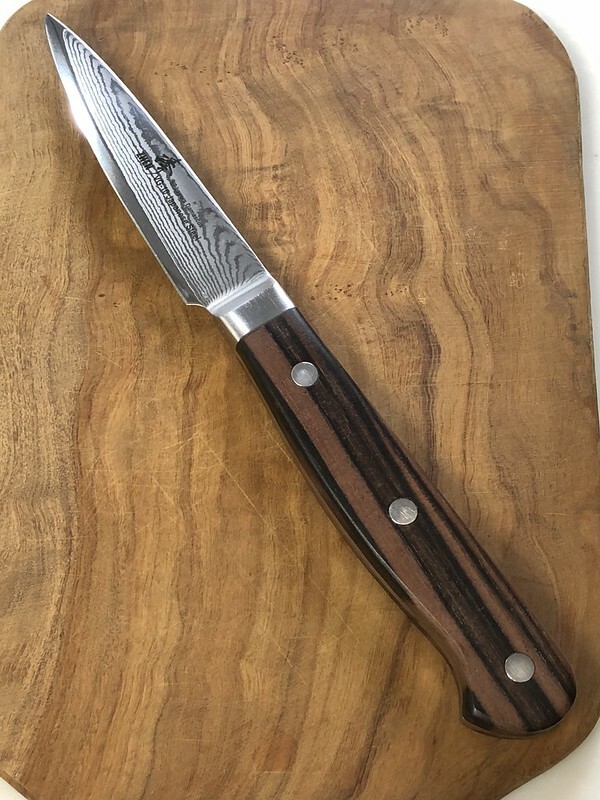 They are much more resistant to warping and cracking than untreated wood as well as being chemically resistant, great for kitchen knives and sporting knives. Thanks for the welcome, fellows! My only “problem” with getting bitten by the bug is the lack of local support. Once upon a time, Japan had some great swordsmiths and artisans, but few young folks take up the reins of family craft any more. Case in point, I came here as a teen, and could take a short trolley ride to a famous shopping district and watch an old guy make knives, scissors, and swords in the back of his shop. I could never afford any of his wares, but watching was free, and while I couldn’t speak the lingo that well yet, the “Ojii-san” would show me me a few sharpening tricks on his ancient equipment. I was into building slot cars and plastic models at the time, so this little tools shop was my go-to place. I met my wife-to-be at this time, and her father gave me a “gun-to” that made it’s way back to Japan after the war with the Russians ... all beat up, but not too rusty. I brought it to the old fellow, and after he taught me how to sharpen it, I gave it to my father after he retired, and now my older brother has it in GA. The point of the story is that the old artisan soon passed away, and his son chucked the forgery, but just sold pre-made knives and mediocre tools, and occasionally sharpened scissors and kitchen knives ... and now his son now sells cheap made in China junk nail clippers and plastic kitchen stuff. Gaaahhhh! Back to my problem, everything I want has to be shipped, which can easily add 30~50% to any order. Living in Japan’s second largest city means I won’t be getting a forge or banging away on an anvil, either. Finally, anything much longer than 4” is very, very illegal to carry these days. Sigh. But I will enjoy making some gift knives for friends, and could always use nice tool knives in the workshop. I don’t suppose chisels qualify as knives, do they. I’m looking into stabilizing some of my own wood. I found some stabilized stuff here, but it expensive! Shipping a chunk of wood would cost a lot more than the wood. Maybe I could find some at WoodCraft next time I’m in Hawaii. The whole stabilized wood thing is foreign to me! in luthiery, we go to great lengths to find lightweight, strong, inherently stable woods to make an instrument that will be used hard, but coddled otherwise ... all the while possessing a “tonal ring.” In this discipline, knife scales are supposed to withstand all kinds of abuse and adverse conditions, and weight and tonal qualities are the least of considerations. LOL. My personal stash of fretboard materials are pretty inherently strong woods like ebony, bloodwood, wenge, rosewood ... but none are particularly kitchen usable without some kind of sealing. I doubt these would be candidates for stabilizing, though ... ? Last edited by charisjapan; 09-30-2018 at 09:38 PM. Hey @dtec1, thanks for the post. Trust me, I know the blessings of a good forum. I can already see the zeal and information available in the threads, and the willingness to teach the uninformed . My experience with building guitars started on a whim ... was just going to fix an unusable guitar, and with the encouragement of a great forum found myself building a few guitars and basses of my own design. I finally found a luthier buddy a few hours away in Tokyo, and we meet once in a while. He played my most recent guitar and said he’d put it alongside a brand-name Custom Shop guitar any day. He and I both got the same kit from KnifeKits, so you may see him sign up here any day! Welcome! Nice looking pieces there! Reminds me way back we'd shipped supplies over using Black cat/Yamato Transport. Want to say OCS was the other shipper used. They began sourcing domestic materials after a bit. Kinda miss keeping up with them through the supply hunts. I'd skip trying to stabilize the wood yourself. You either end up with a half baked result or a decent result but significant investment in time and money not to mention time lost from actual knife making. Professionally stabilized wood is quite different than the homemade product when you get down to the molecular level. And you're right about your fret board woods in general. The rule of thumb is that oily woods like rosewood are not good candidates for stabilizing but not every piece of rosewood, ironwood, ebony, etc is oily and I have sent them out to be successfully stabilized. 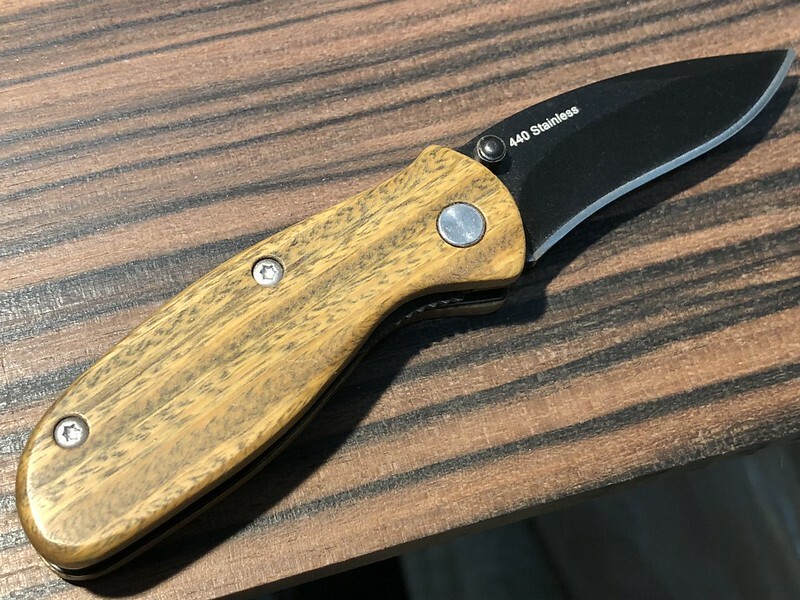 Stabilized woods may seem expensive but the money I've saved by not needing 100 different kinds of finishing products plus the fact that you simply put the cost into the price of the knife makes it worth while to me. Some people think stabilized wood looks like plastic and it does if you want to think about it that way but it looks like wood with a urethane finish without the mess and that works for me. “Half baked results” ... good pun! Agree with you about doing the stabilization myself ... saw that if I’m doing small amounts, it’s more expensive to set up than just buying a few pieces. Looked at the Jantz site ... some nice stuff! But the stuff I want is ek$pensive! . The Dymondwood looks nice, and will definitely consider it ... and I think I saw something like it at WoodCraft in Honolulu. Next time I’m in the U.S. will definitely bring some home.